This story is a bit different from my usual biographies of psychological warfare specialists. In most cases they were alive to be interviewed and they talked about printing leaflets, perhaps dropping those leaflets from aircraft and sometimes radio and loudspeaker broadcasts. In this case the propagandist is deceased and all we have is his papers. But what papers: talk of how he got the job; the training; discussions of salary and what to wear; even the end of the war and how the people were dispersed; This story will be low on activities because we simply dont know, but will add a lot of background that is never discussed in most biographies. We will see how things were done. I hope the reader will find it interesting. We must remember at the time The United States was trying to figure out this propaganda thing. It was amateur hour. Roosevelt had named a coordinator of information and it had not worked. Things were moved around into black propaganda (OSS), white propaganda (OWI), military propaganda, etc. The Navy worked with the civilian OWI in Hawaii, Guam and Saipan; the Army under General MacArthur in the Southwest Pacific area refused to work with the civilian OSS. Things were being tried out and fine-tuned. It is nice to get an inside look at how they did it. Professor of Drama and Director of Dramatics at Tufts University for over 35 years. He and his wife Germaine (a native of Southern France, graduate of the Sorbonne and French professor at Tufts) worked from home to support the Free French. 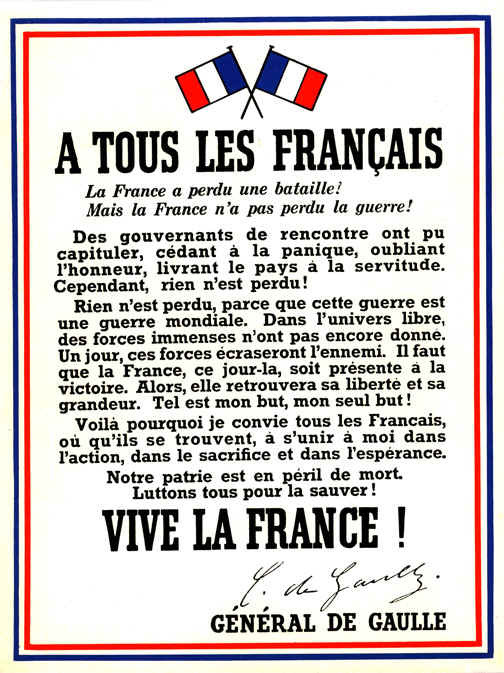 I wish to express my very sincere congratulations on the ever increasing enthusiasm for the cause of the Fighting French which your efforts are producing. To get an idea of how much the Balch family was valued for their work in support of the Free French, when de Gaulle visited Great Britain in February 1942 and met Queen Elizabeth, a picture was taken. 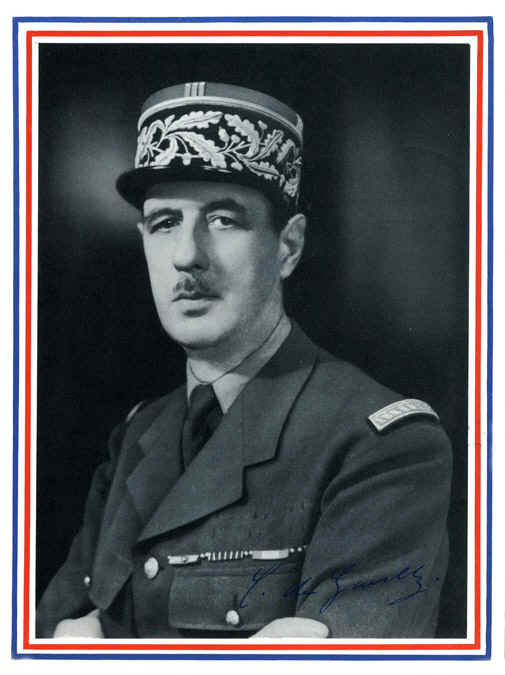 De Gaulle autographed the photo and it was later given to Balchs wife Germaine, who was also a strong supporter of the fighting French. I understand all your difficulties regarding the dehydrated foods, but if you can arrive at a result, I will be very glad, because the poor French sailors are in great need of them. Note that the United States was not even in the war, but it will be in less than a week. 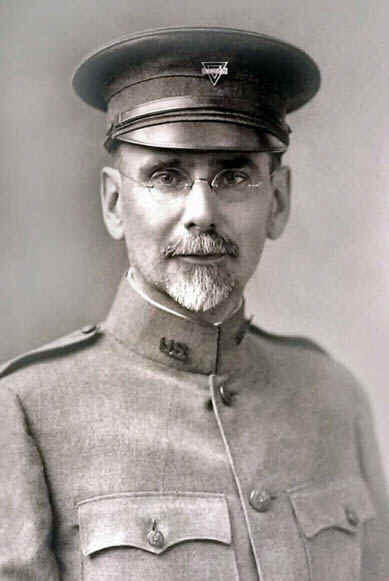 During WWII Balch became a field representative of the overseas branch of the Office of War Information from 1943 to 1945. His duties also seem to have involved the Psychological Warfare Branch (PWB) and the United States Information Service. It appears that his French language skills were excellent and he was used by other agencies to write and read reports and propaganda in the French language. He was a war correspondent for the United Nations radio at Algiers and Tunis, Chief of the Cable Desk of the Psychological Warfare Bureau in Algiers in 1943, and Chief of the French Press and Radio Analysis Station of the United States Information Service in Paris in 1944. 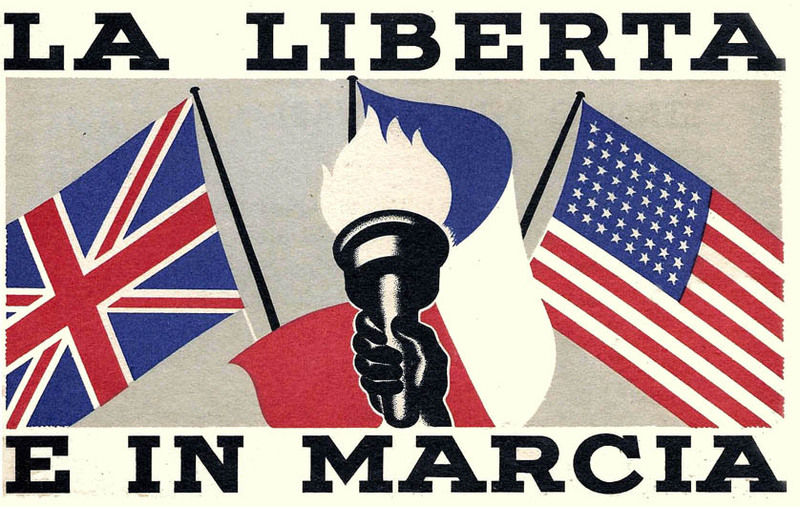 Whatever happens, the flame of French Resistance must not go away and will not go away. A makeshift Government may have capitulated, giving way to panic, forgetting honor, delivering their country into slavery. Yet nothing is lost! Nothing is lost, because this war is a world war. In the free universe immense forces have not yet been brought into play. Someday these forces will crush the enemy. On that day France must be present at the Victory. She will then regain her liberty and her greatness. This is my goal, my only goal! That is why I ask all Frenchmen, wherever they may be, to unite with me in action, in sacrifice and in hope. Our Country is in danger of death. Let us fight to save it. The highest salary I can offer is $3800 plus $680 overtime. As soon as you are sent overseas you will draw a living allowance of $2016. I have no way of knowing whether our men will wear uniform or mufti. At the moment we are in mufti; our men in North Africa are in uniform. If men in London go to uniform, they will have to buy them at their own expense. OWI men when abroad can use the Army medical and dental services without charge. A voluntary annual $125 insurance police will pay $10,000. The terms of enlistment are For the duration. Should a man resign he must return home and report to his draft board. Mr. Marston Balch has appeared in this office and is under proper orders. 1. Propaganda as a weapon of warfare. 2. A basic plan of United Nations propaganda. 3. Political reconnaissance, opinion sampling and polls. 4. 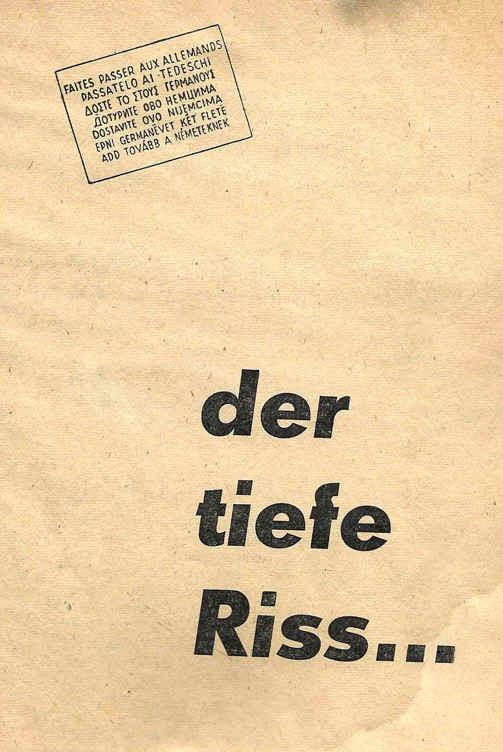 Principals of leaflets and other forms of propaganda writing. 5. The set-up of OWI. 6. Outpost organization. 7. Choice of media for different target. 10. The nature of the enemy. 13. Broadcasting, recording and monitoring systems. 14. Security and field operations. 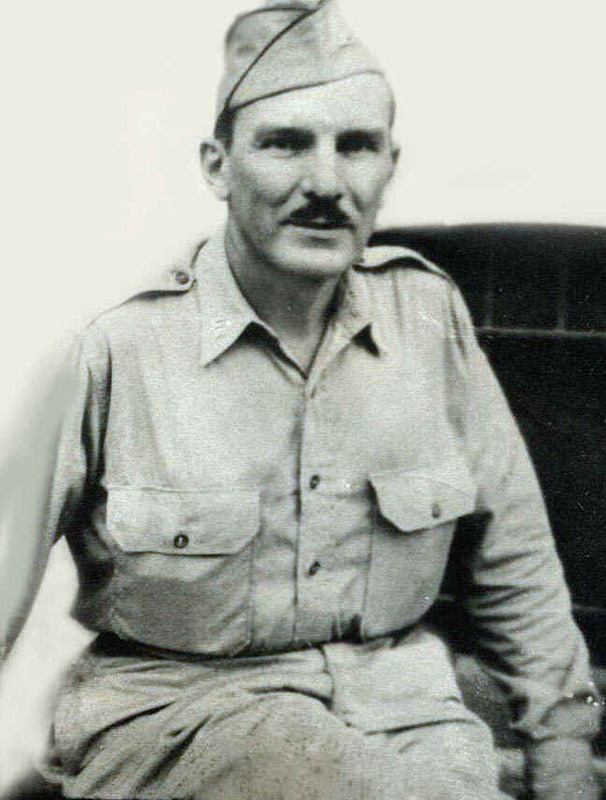 In late June 1943, Balch was given instructions on preparation for his overseas duties. He was told that the Marine Hospital in New York City gave inoculations to OWI Field Representatives. He would get typhoid, tetanus, typhus cholera, and smallpox. He did not need to get the shot for yellow fever. His passport application was at the State Department and he would fill it out there. He will carry U.S. Army credentials of a type issued to war correspondents and he will travel by Army ship to Europe and be allowed 130 pounds of luggage. A registrant of this local board has applied for a permit to depart from the United States, and this local board, being convinced that the registrants absence is not likely to interfere with the proper administration of the Selective Service Law, hereby authorizes the said registrant to depart from the United States and to remain absent therefrom for an indefinite period. Tenure subject to satisfactory medical examination. FOR DUTY OUTSIDE THE UNITED STATES. Patrolled in Washington D.C.
Notice that Balch wears no rank on his military uniform. The tri-fold ID if found can be dropped into a mailbox and is addressed to the Adjutant General, United States Army, Washington D.C.
You are hereby designated an assistant representative of the Overseas Operations Branch of the Office of War Information at Algiers, Algeria. You will do radio announcing and writing in French and will receive, upon arrival at Algiers, complete instructions as to these and any other duties. In addition to your salary, you will receive an annual living and quarters allowance of $1,728. The OWI sent a letter to the Customs Bureau in September 1943 stating that Balch was a representative of the Office of War Information and asked that courtesies be extended to him as a government official. The military and Allied authorities are asked to authorize the crossing of the border. It is signed on one side by French military intelligence and on the other by a Colonel on the local general staff in Naples. It really does not say anywhere what his job is, just apparently lets him go where he wants. I have often talked about the way the United States military will move heaven and earth to get soldiers a real Thanksgiving dinner with turkey, stuffing and all the trimmings. 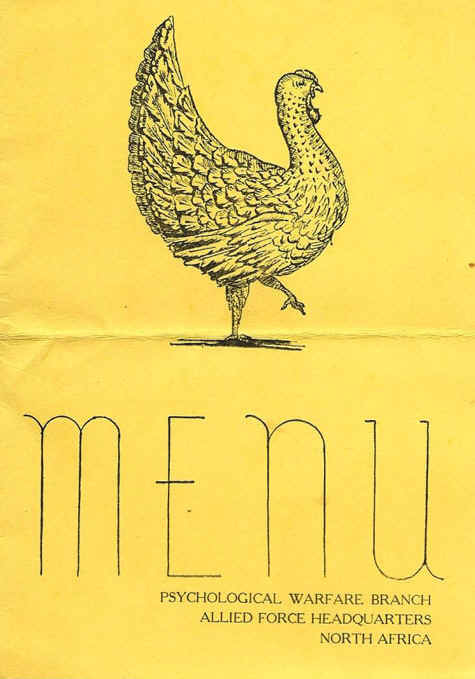 The card was printed by the PWB Mobile Leaflet Unit and although they put a chicken on the cover, they did serve turkey. 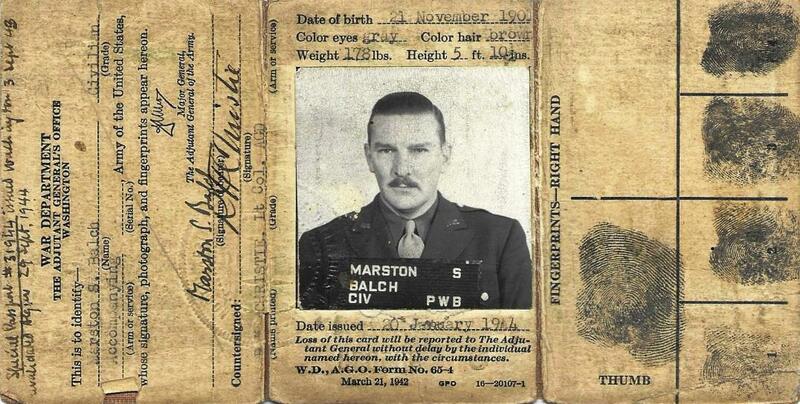 The bearer, Marston Balch is hereby certified to be a civilian employee of the United States Government attached to the Army of the United States in the North African Theater of Operations and as such, if captured by the enemy is entitled to be treated as a prisoner of war. He will be afforded the same privileges as an officer of the U.S. Army of the grade of Captain. By the Command of General Eisenhower. Civilians on desk jobs in North African base cities  Algiers, Casablanca, Tunis, etc. - do not need military uniforms. They are required only in advanced operations near the fighting fronts. Most items of military clothing can be bought at the Post Exchanges at these stations. Since heating is rare, woolen clothing  of the kind worn in New York during the winter  is desirable. The best winter coat for North Africa is a water-proof trench coat with a warm, removable lining. OWI representatives are entitled to weekly officers rations at the Army PX. These include clothing, tobacco of all kinds, candy including chocolate bars, gum and mints, toilet soap, laundry soaps, flints and lighter fluid, hair oil, playing cards, pencils, notebooks, fountain pens, ink, mouthwash, toothpaste and tooth brushes, brown shoe polish (no black), shoe brushes, shaving brushes, spot remover, matches, sun glasses and sewing kits. There are auxiliary counters for women that sell special such as Kleenex, creams, etc. Certain items of womens clothing are also for sale but are intended primarily for WAC and Red Cross girls. It is amazing that someone thought to classify this document. I also found the no black polish comment funny. Whenever veterans get together and talk about the old days the term brown shoe Army will come up. In November 1943 Balch received orders to report to Tunisia from the Armys Psychological Warfare Branch (PWB) at Allied Headquarters. 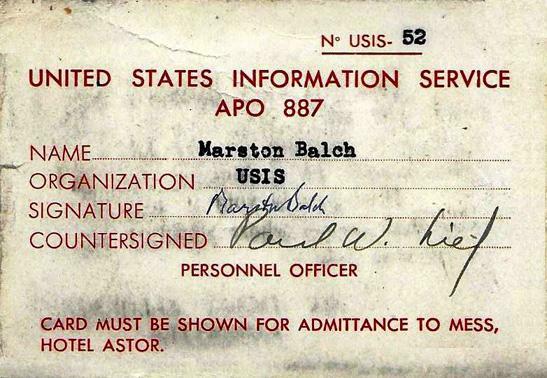 To show how he was being shared by three organizations, here is Balchs pass to take meals at the USIS mess. This was quite common during wartime. In another article I mention an officer was in both the Office of Strategic Services (at night) and the Office of War Information (by day). We see that Balch apparently had his choice of where to have dinner. The Army also gave him a card. Notice the stripes on the card. That is very British and they often mark their classified documents using that technique. 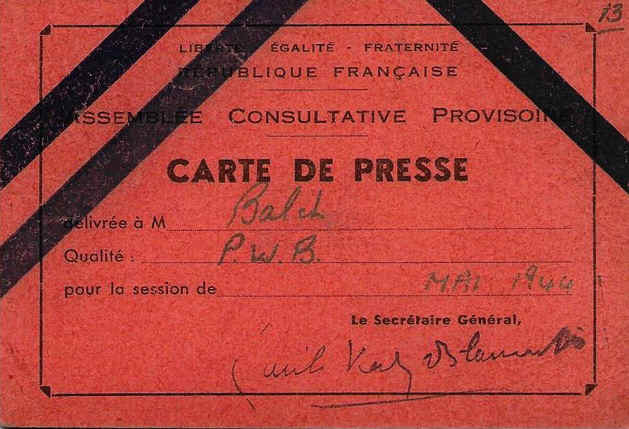 This implies to me that the card was issued by the British side of the PWB. General Eisenhower was very careful to share the duties between Americans and British equally so all that everyone felt like their work was appreciated. Mr. Auberjonois enlisted and was sent to a top-secret training camp in Canada that was run by the British intelligence service. He went on from there to a variety of missions, including stints as top aides to both General George Patton and Dwight D. Eisenhower. He set up allied radio operations in North Africa and helped weave a web of deception to fool the Germans about where the D-Day landings would occur. He also broadcast allied propaganda to French-speaking Europe. 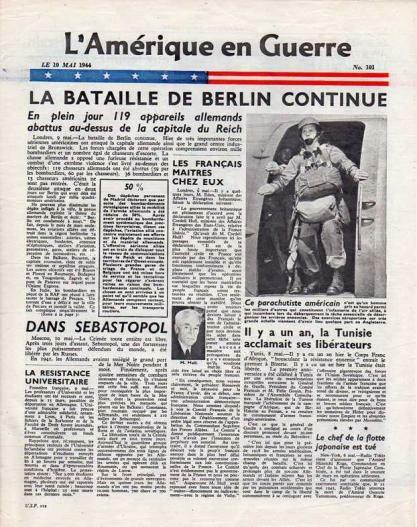 Two days after D-Day, he managed to publish La Presse Cherbourgeoise, the first free newspaper of liberated France. His son, Rene Auberjonois acted in Star Trek Deep Space Nine and Boston Legal and he reads many of the audio books I listen to. 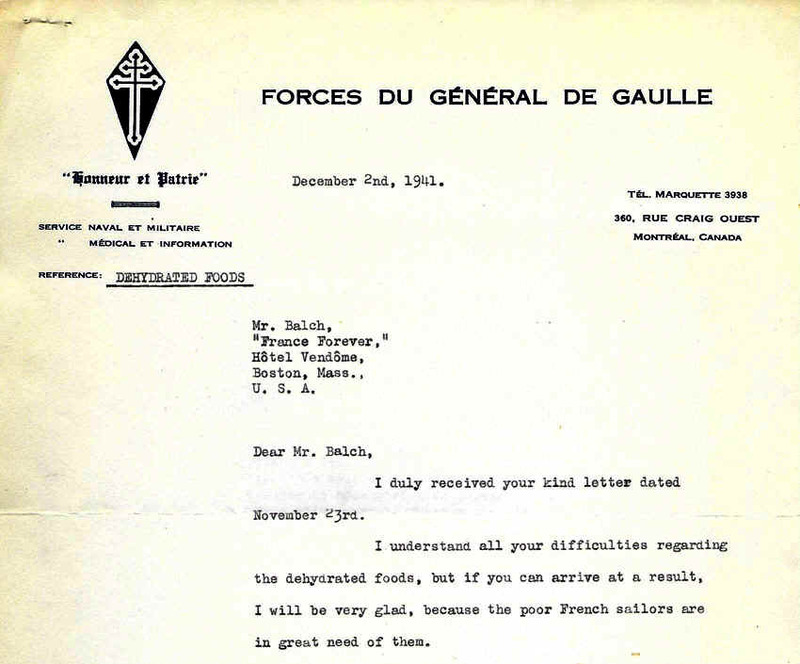 We know from another letter to Balch that he was in Tunis with the PWB in January 1944. Sandy Koffler, the Chief of PWB United Nations Radio in Rabat wrote to apologize for not buying a suitcase that Balch had given him 750 francs to purchase. He explains that his first paycheck was sent from Algiers to Casablanca and apparently got no further. He did not have money to eat in Rabat so spent the 700 francs on food. He did just receive a pay voucher and will buy the suitcase shortly. 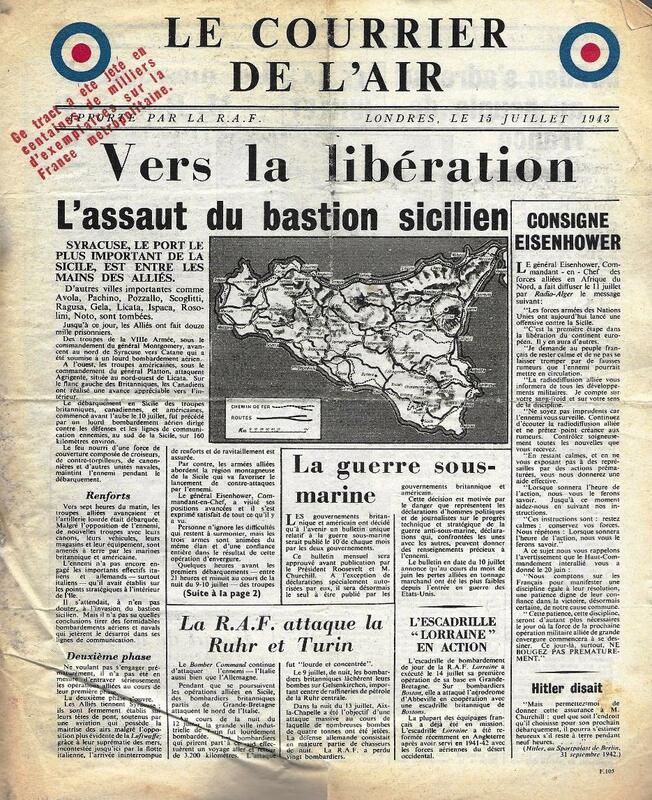 In March 1944 we know that Balch was in Algiers. 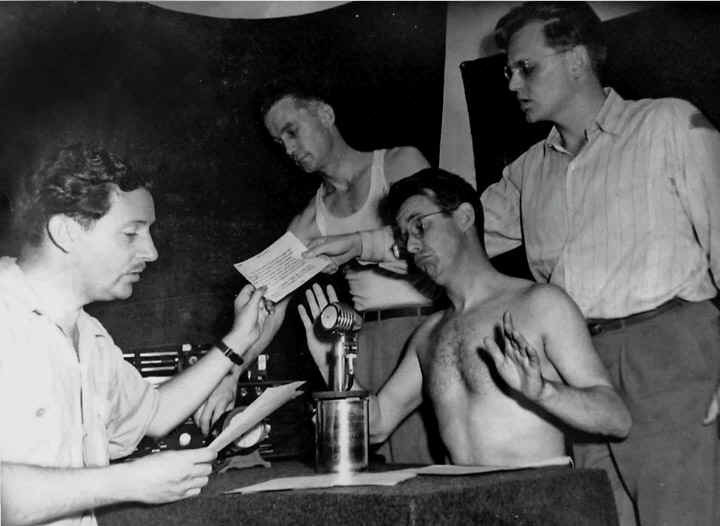 We have a photograph dated March 1944 that features Balch as one of the crew in the Central News Room, PWB, Allied HQ, Algiers. 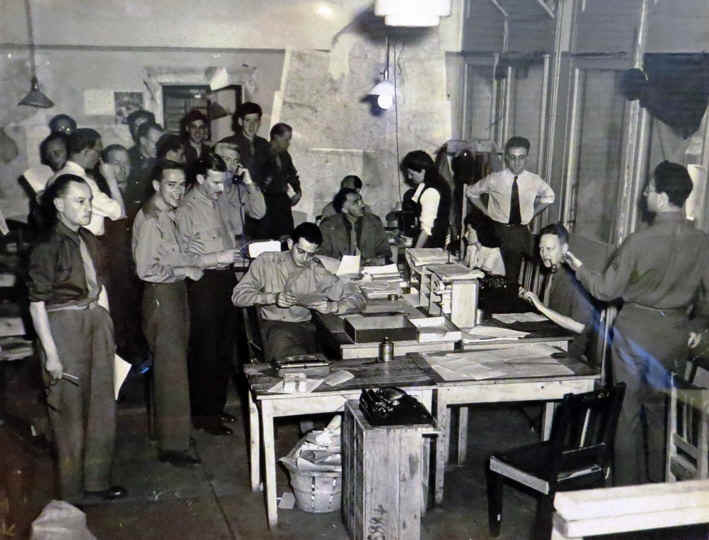 The branch of the PWB Algiers News Division known as the City Desk has been in operation since 8 January 1944. Its specific functions include those of clearing to basic and outgoing news and by cable to the OWI in New York and London all important French news reaching it from Algiers sources or through Algiers channels, also, more recently, clearing in the same way political news reaching it from Italy. 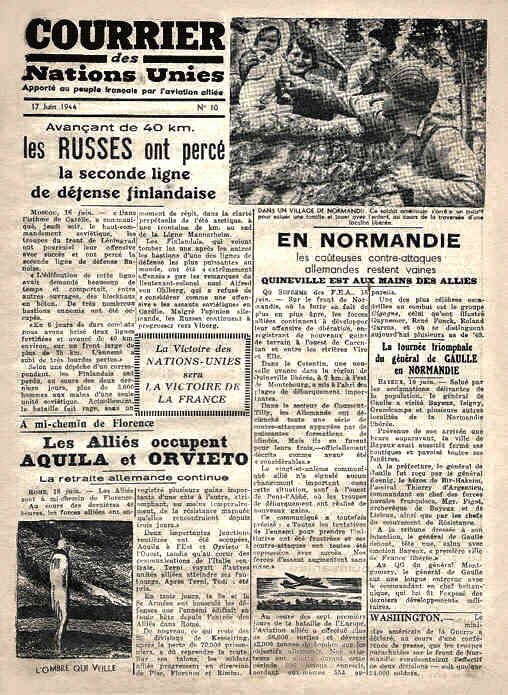 The City Desk normally restricts its news to non-military news, particularly French political news; although in answer to the outposts and From New York and London, stories about French military training centers in North Africa and especially about French troops in action in Italy have been sent. [Note] This does seem to explain why we find some Italian material in Balchs papers. Apparently the Free French were fighting on the Allied side in Italy and as a result he had to keep an eye on that country too. We have just had word the Mr. Balch has gone on into France. Under separate cover I am sending you his new address whereby you can reach him. I suspect his movements were classified and this separate cover would be a letter delivered by personal messenger and not part of the normal U.S, Mail. In fact, we find confidential orders for Balch to proceed to Naples, Italy on 12 October 1944 to report to the Psychological Warfare Branch as a permanent change of station. Early outbursts of optimism have given way to a more sober treatment. Papers have noted the air of cool confidence prevailing at SHAEF, and most have stressed, at one time or another, that the situation must be regarded seriously but not in any tragic fashion. The military commentators and armchair generals have had a field day, but their evaluation of the situation, despite a tendency to over-enthusiasm at times, has been on the whole prudent and logical. Correcting, proofreading and editing of daily press review. Cabling summaries and extracts from the Paris daily and weekly press. 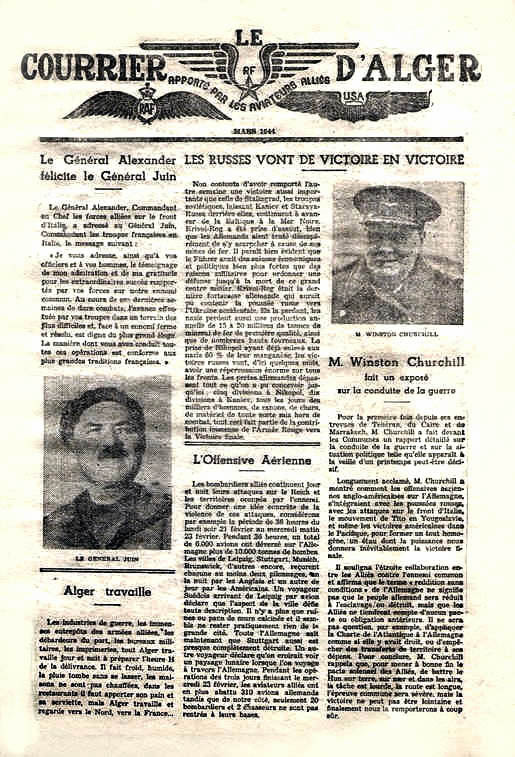 Analysis of the Paris weekly press. Check daily and weekly radio reviews and office reports. Special services to USIS sections, visitors and general administration of Analysis Desk. 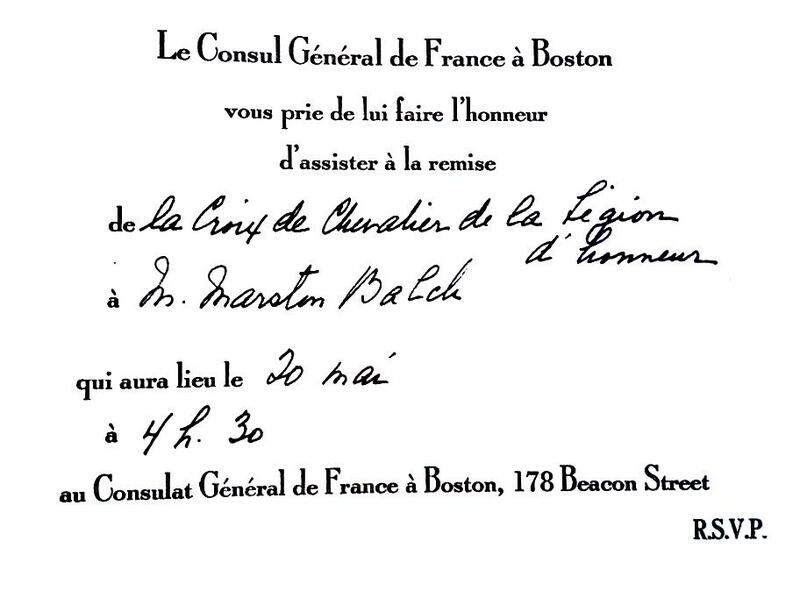 Because of his services to France during the war, Marston Balch was awarded the title of Chevalier of the Legion of Honor by the French Government. We cannot say with certainty the Balch wrote or printed any of these leaflets. He has passed on and he is not talking. What we can say is that he seems to have been a bit of a Francophile and worked both as a civilian and as a government officer to help the Free French, even joining some of their patriotic associations. They knew him and he knew them. 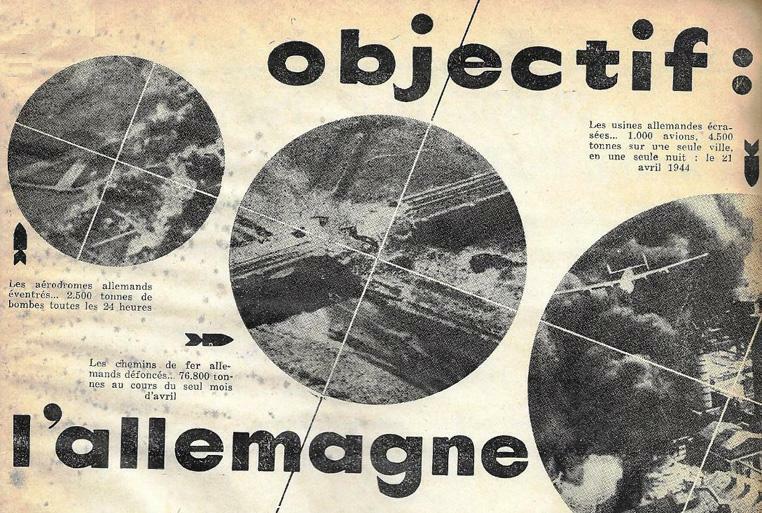 He saved everything and there are a number of French-language leaflets in his papers. I have not seen most of these before and they bear no codes. I think we can safely assume that Balch had some part in their production and kept them as souvenirs. Our friends have arrived. Welcome them by placing this leaflet everywhere! During the war, thousands of French citizens were sent to Germany either as prisoners or as workers. 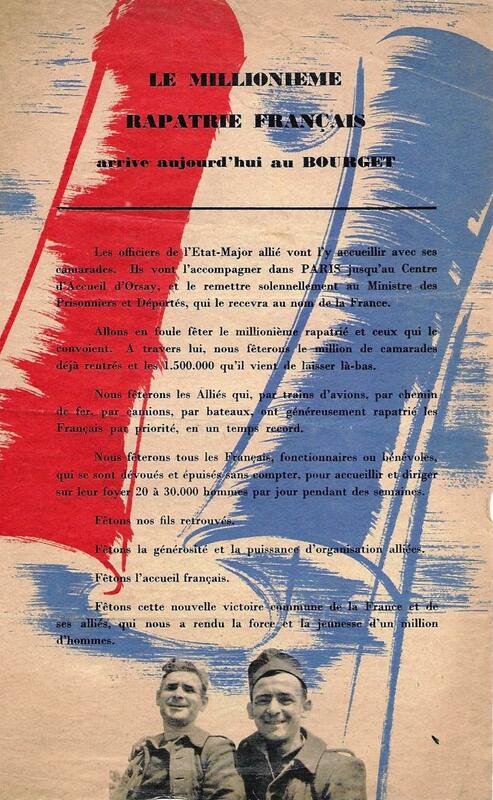 In this leaflet we see that the millionth Frenchman who was taken to Germany is returning to the Bourget Airport. I am sure they turned out a nice crowd to receive him. 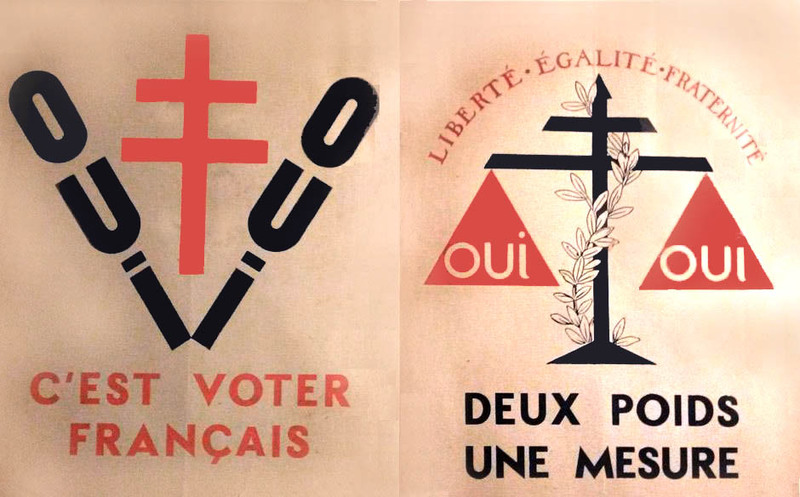 Yes, Yes - It's a French vote. 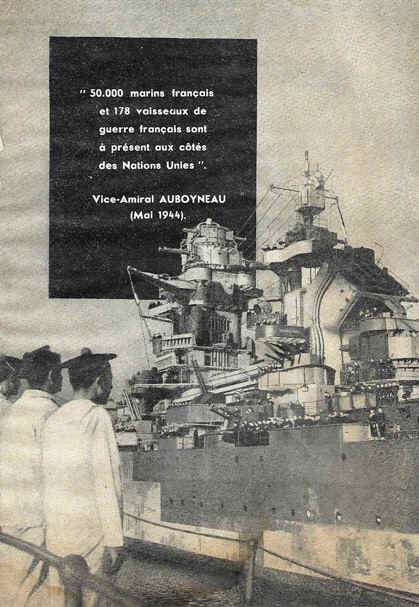 50,000 French sailors and French warships have now joined the United Nations. 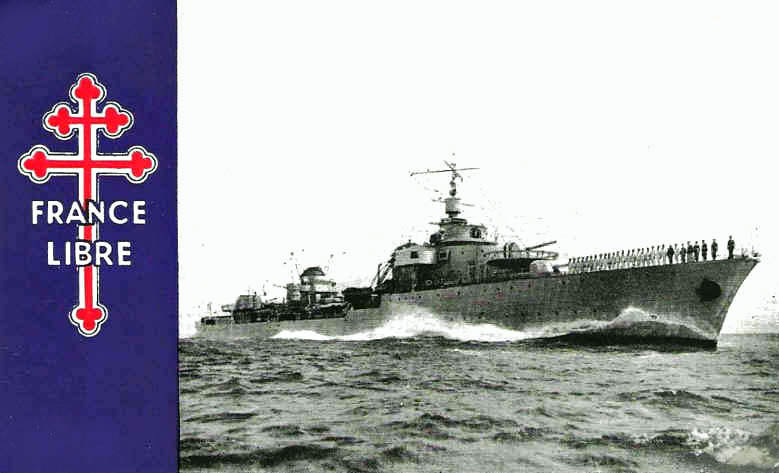 A powerful French fleet contributes today to the sacred mission of the liberation of France. To remove the German from the countries he occupies, the French, English, American, and Soviet airmen, the squadrons of all the United Nations will strike the Boche wherever he may be. 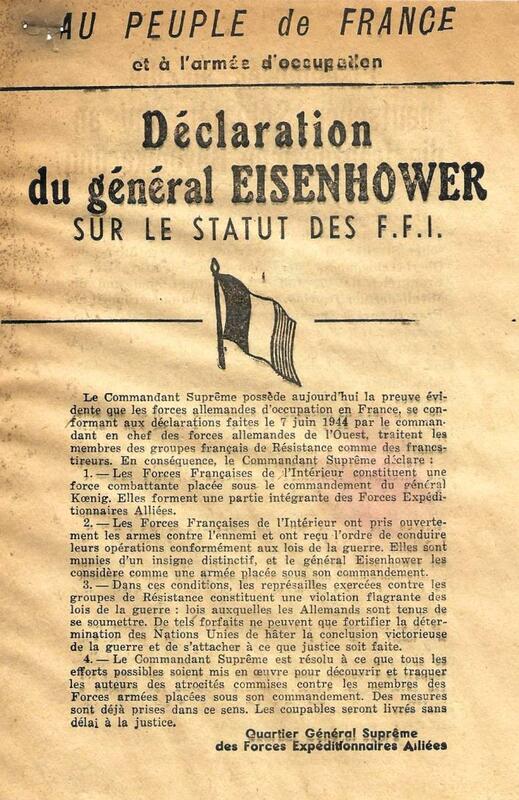 Declaration of General Eisenhower on the Status of the F.F.I. The French forces of the interior constitute a fighting force placed under the commandment of the general Koenig. They form an integral part of the Allied expeditionary forces. The F.F.I has taken up arms openly against the enemy and has received the order to conduct their operations in accordance with the laws of war. They are furnished with a distinctive emblem and General Eisenhower considers them as an army placed in his command. In these circumstances, reprisals taken against resistance groups amount to a fragrant violation of the laws of war, laws to which the Germans must submit. Such reprisals can only strengthen the determination of the United Nations to hasten the victorious ending of the war and insist that justice shall be done. The Supreme Commander is resolved that every possible effort shall be brought into action to find and track down the authors of atrocities committed against the armed forces under his command. Measures have already been taken in this direction. The guilty will be handed over to justice without delay. Supreme Headquarters Allied Expeditionary Forces. The Russians break through Finland's second line of defense. The Allies occupy Aquila and Orvieto. Yesterdays allies are about to arrive. 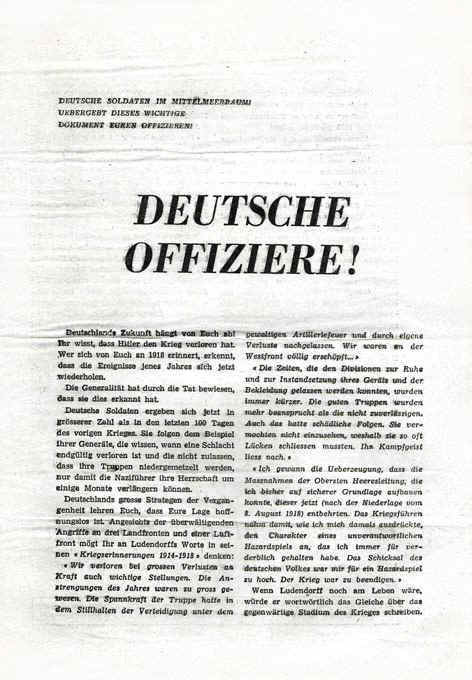 Spread this leaflet; pass it between you and attach it on the walls of your city.Come and meet us with this leaflet and hurry the day of liberation from the German yoke. From your attitude we will know our true friends. Of course, if one were cynical he might consider that the U.S. was printing these leaflets to assure big crowds when they marched into these liberated cities. But, I prefer to think that the locals printed them as a welcome. THE GREAT RIFT: The revolt of the Generals has uncovered a deep rift that runs right through the German nation. 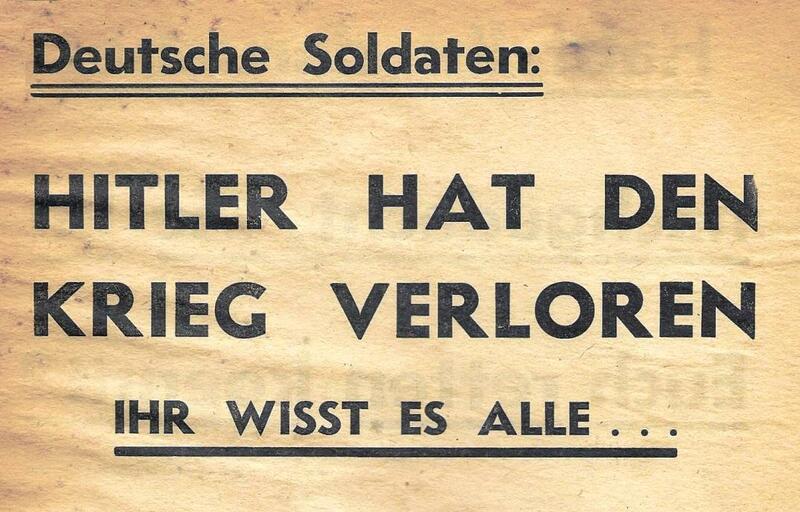 On one side are the fanatical Nazis who wish to continue the war until Germany is completely destroyed; and on the other are all those Germans  including many with a good insight into Germanys real military situation  who want to save what still can be saved. ITS ALL THE SAME TO US: We of the United Nations take no part in this quarrel. On one hand we will have nothing to do with Hitler; on the other, we have little time for the rebellious Generals. In the first place they helped Hitler to power, and in the second they hope that, when they sue for peace, to save the remains of Germany's military might. If Hitler has them shot, it is very much what they have brought on themselves. 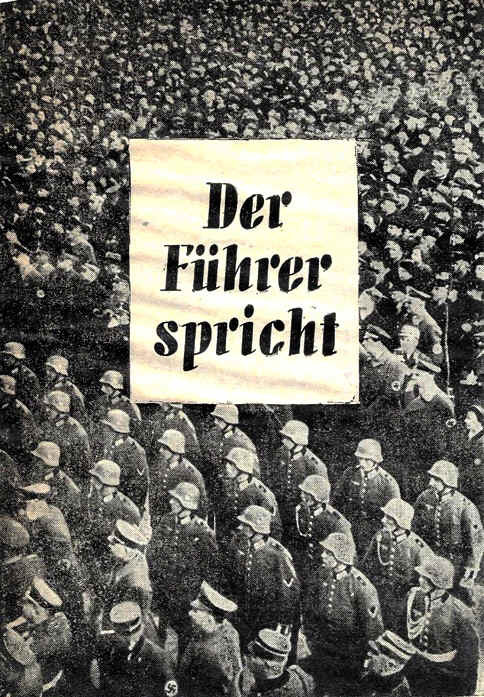 It is interesting that this leaflet mentions Hitler having the Generals shot. In fact, the worst offenders were hung by piano wire and the executions were filmed for Hitler to watch at his pleasure. And you - standing here in the south of France and waiting for the great miracle that Adolf Hitler has promised you. The miracle happened: The often-declared beaten Russian army is in your home country. You know what war means. Destroyed houses, women and children on the run, devastated fields and villages. These are the unavoidable consequences of war. The Russians know this: they learned it to their bitter cost. This fate is now threatening your native land. Think of your wife, of your children: think of your parents, your sisters! And you remain here in the south of France, waiting for the great miracle that Adolf Hitler promised you. How long will you go on waiting? Decide. Save your country, save Germany, whatever is left to be saved. Everything that is dead to you can still be saved. You can do it and you must do it, and that will be the great miracle. Unconditional surrender does not mean enslavement, does not mean the annihilation of the German people. The German people will live. If they have houses to live in: if they have factories to work in, if they have fields to sow in. Hitlers come and go, but the German people will live on. What can be taken from you, besides wife and child? What can be taken from you besides your home land. You have no villa to lose, no fortunes, like the Party bosses. 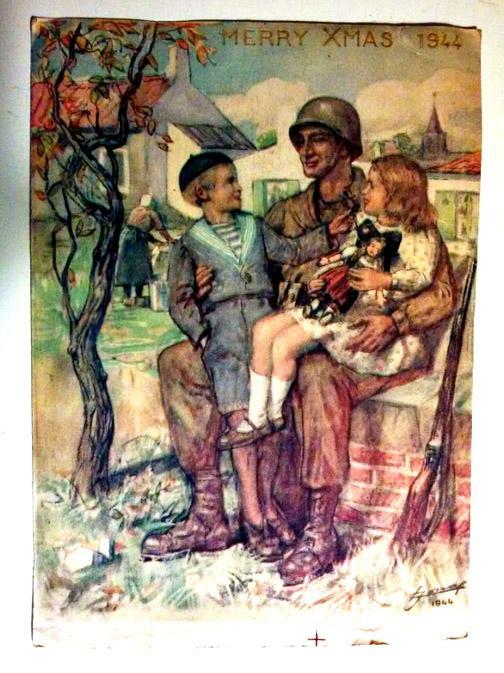 You are going to work, as you have always worked: you are going to live with your family, as you have always wanted to live, without war, without NAZIs. You will, you must, build Germany up again. That will be the great miracle that Hitler did not promise you, but that peace promises you and will bring about. GERMAN SOLDIER - HITLER HAS LOST THE WAR. Have you thought about how to save yourself? It will, whatever happens, be our victory. The year 1941 will bring the completion of the greatest victory of our history. The year 1942 should - so we all ask the Lord God - bring the decision to the rescue of our people and the nations associated with us. The year 1943 may be difficult, but certainly not heavier than the ones that are behind us. The National Socialist leadership is therefore determined to lead this fight with the utmost fanaticism and to the last consequence. And should it go wrong. What will you do? What must you do? The Fuehrer gives you the answer! If the resources of governmental power cause a nation to be destroyed, then the rebellion of every member of such a people is not only lawful but obligatory. Germanys future depends upon you. You know that Hitler has lost the war. Those of you who remember 1918 will realize that the events of that year are now repeating themselves. The Generals have proved the fact that they have realized this. German soldiers are now surrendering in greater numbers than they were doing the last 100 days of the previous war. They are following the examples of their generals who know when a battle is finally lost and do not wait for their troops to be decimated so that the NAZI regime can prolong their reign for a few more months. 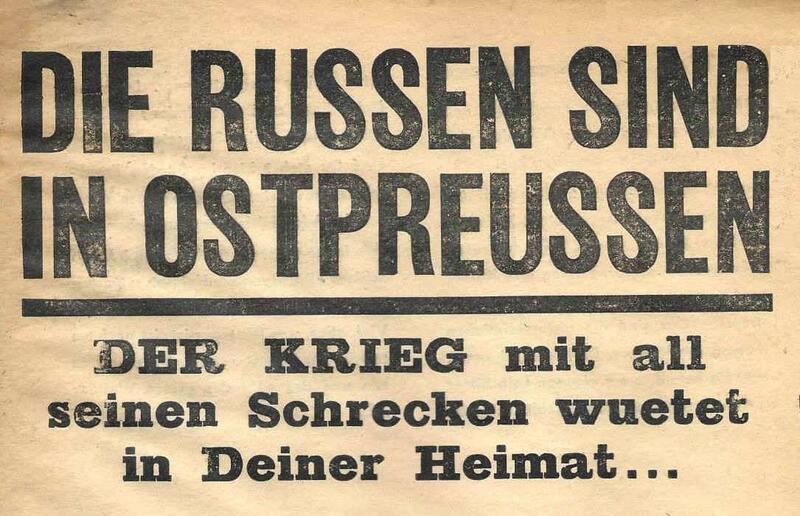 If Ludendorff were still alive, he would write the same thing, word for word, about the present stage of the war. There were a number of patriotic song sheets among Balchs papers. 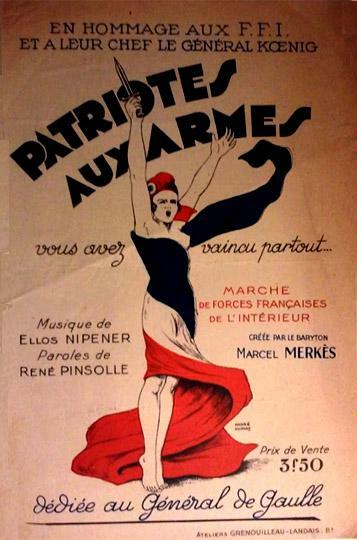 He might have just liked music, but since we know that the OWI and other American Armed Forces prepared and wrote numerous propaganda music sheets and leaflets featuring music, it is very possible that these songs were prepared by the OWI to fill the French with patriotism and motivate them to carry on during their days of occupation and liberation. 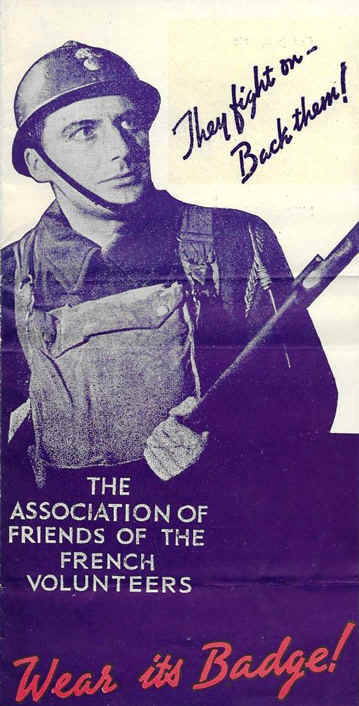 For more information on the use of music as propaganda in wartime click here. I assume this 1943 march was prepared for General de Gaulle and his Fighting French forces in North Africa. This 1944 song honors the patriots of the French Forces of the Interior, sometimes called the Maquis for a nasty thorny bush in the hills where the Underground operated. After the invasion of Normandy in June 1944, at the request of the French Committee of National Liberation, SHAEF placed about 200,000 resistance fighters under command of General Marie Pierre Koenig, who attempted to unify resistance efforts against the Germans. General Eisenhower confirmed Koenig's command of the FFI on 23 June 1944. 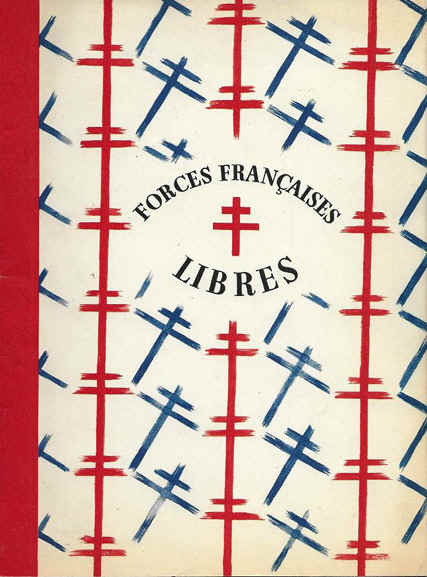 This booklet is the short history of the Free French from de Gaulles escape, the meeting with King George VI, and the building of the Fighting French Army, Navy and Air Force. On 12 October 1944, Balch and 17 other PWB civilians were suddenly sent on a mission to PWB Headquarters in Naples, Italy. We do not know where they left from because the confidential orders simply say Mediterranean Base Section. The orders say PCS and that means that this was a permanent change of station. Balch would be there for a while. 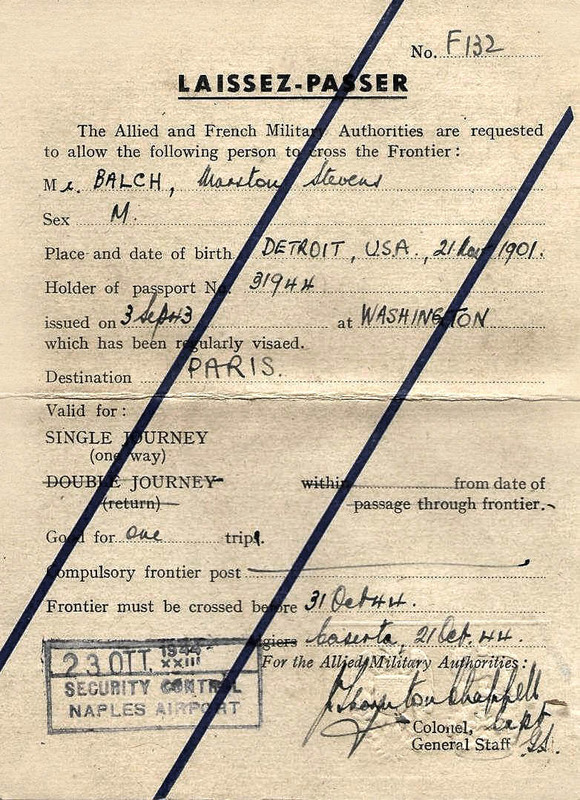 We see that Balch was issued a series of passes to allow him to use all the services available in Naples, all dated 16 October 1944. He was issued a Hospitalization Pass, a Curfew Pass, a Vehicle Pass and a Special Official Pass. I hope he had a thick wallet. Paris has 19 daily newspapers plus a French Army newspaper. The total circulation of the 19 papers is well over 3,000,000. FIGARO is the leading paper of the Conservatives and makes about 3 million francs a month. 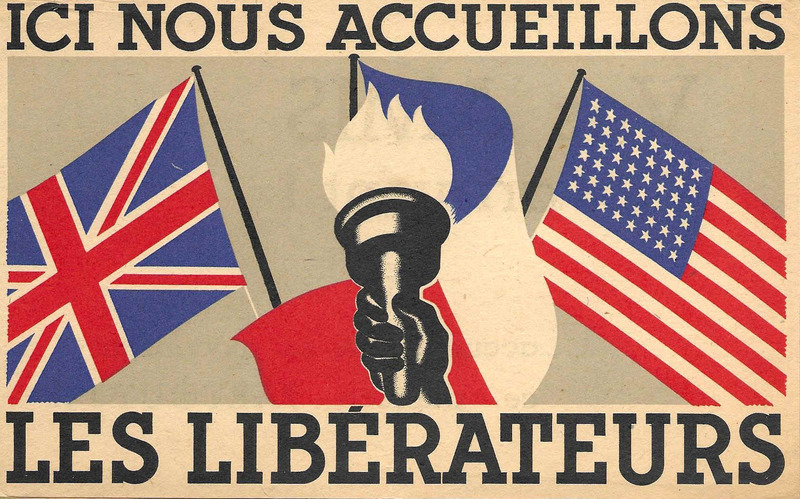 LIBERATION, the information Journal and COMBAT, the resistance journal both make about 1 million francs a month. HUMANITE, the Communist newspaper has the best circulation of all. At the time of liberation, the Provincial Government gave each paper a loan of 3 million francs. The fact that the government might call in the loan at any time might be considered a threat to their free expression. 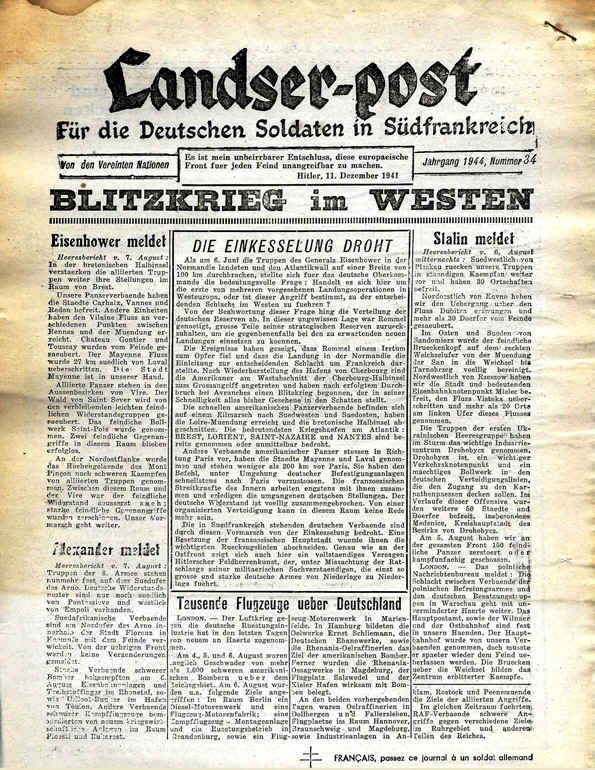 The government suspended all of the newspapers that were deemed to have served the Germans during their occupation. None of the Paris newspapers so banned have thus far been given permission to reopen. It is impossible to say who printed this card because there is no printers imprint on it. That might lead us to think it was made by the Free French, the OWI, or both. And, the French thought that the Americans could have supplied them with more food. 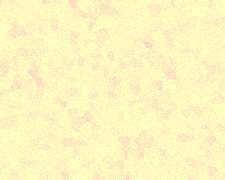 Information concerning War Department, Army or personal activities of a military nature within this theater will not be discussed in private or public and will not be disclosed by means of newspapers, magazines, books, lectures or radio, or any other method, without prior clearance through the War Department Bureau of Public Relations or the appropriate Public Relations Officer of Army Installations. Overseas Information Functions of War Agencies in this field have been transferred and consolidated as you directed. Their transferred personnel have been reduced by half, and many of their functions have ended. 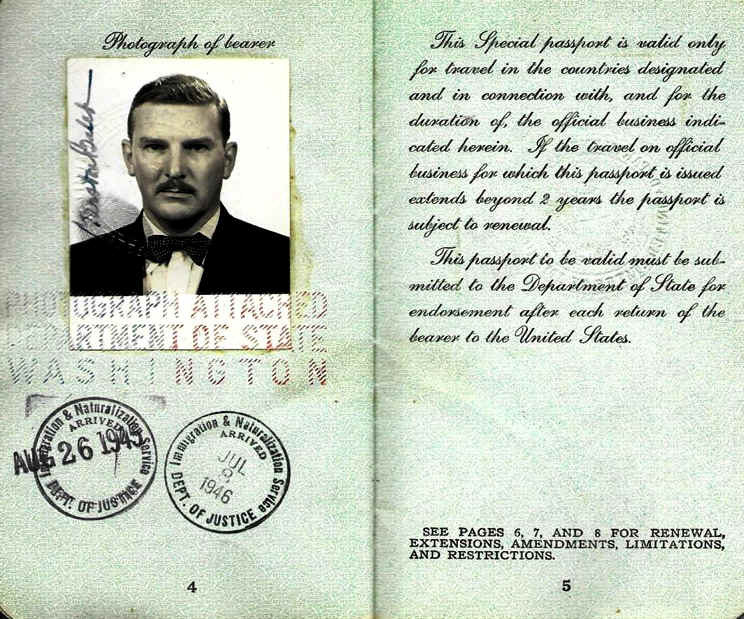 Balch had a 6 April 1946 identification card allowing him to make purchases at the U.S. Army Post Exchange as a member of the U.S. Embassy. Normally only the military and their dependents can enter the PX. Balch seems to have left government service on 5 August 1946. His Termination of Service letter states that he was an Administrative Officer with a grade of AO-11, stationed in Paris with a salary of $4,600 a year and was employed by the OWI and the State Department. He is authorized to drive government vehicles (civilian make) registered with this headquarters, and is an employee of the United States Government hired by the USIS at 12 Rue Agguesseau, Paris. In October 1946, the usual government red tape came into play and Balch was informed that he must be fired because of prohibitions against entry into the American Foreign Service otherwise than by appointment. As usual, when the bullets are flying, rules are bent but in peacetime, everyone becomes very conscious of the rules. Shortly afterwards in early 1947, Balch is in contact with the Division of Research for Europe, which incidentally was previously the Research and Development Branch of the Office of Strategic Services. I found the passport very interesting because it tells us where he went and has various warnings on many pages about where he could not go. On the first page there is a note from the Secretary of State asking that all foreign governments extend protection to him. Page two says he is proceeding abroad on official business for the Office of War Information. Then we see the various customs stamps. Balch first goes to Algeria on official business. There is a stamp from the British and one from the French giving him permission to enter their countries. The American Consulate General gives Balch permission to travel in North Africa and Italy. The American Consulate in Naples gives him permission to travel in France. The American Consulate in Pars stamps his passport. 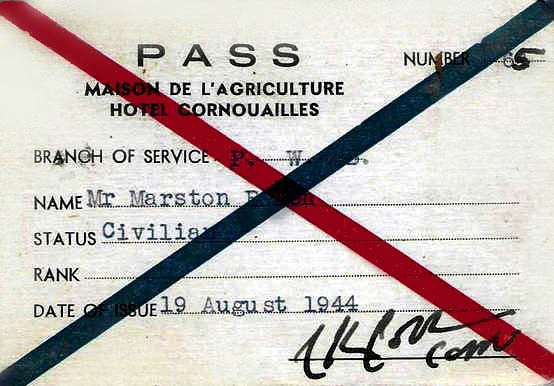 In 1945 the American Consulate gives him permission to travel in France and England for the coming year. We can see that although the war was just over and there were security restrictions all over Europe, Balch was able to travel freely. We deeply appreciate your prompt reply to the questionnaire we recently sent you. In order to provide a comprehensive and up-to-date of our available potential for psychological warfare, we are now further refining our personnel records. The enclosed form OCS 401 is designed to help us in this effort. Neither this letter nor return of the form connotes any offer of employment now makes any commitment either on your behalf or ours. It is important to note that at the start of the Korean War the U.S. PSYWAR capabilities were almost nil. Units were being trained and formed on the spot in an attempt to use psychological warfare techniques on the invading North Koreans. Even so, you can see that the Army was being very careful and non-committal about hiring individuals that had expert experience from WWII. One wonders what motivates a professor to go off and join the Army to help the French. In the case of Marston Balch we have a clue. His father did very much the same thing in WWI. He enlisted in the YMCA 15 June 1918, was the director of the Foyer Soldat (Soldier's Home), 10th French Army Zone du Soldat, a YMCA Secretary for the American Army, and Discharged on 2 August 1919. Ernest Balch was the Director of History at Kalamazoo College, and later the mayor of Kalamazoo. He served as a civilian in World War One with the YMCA Foyer Soldat while in his 40's. 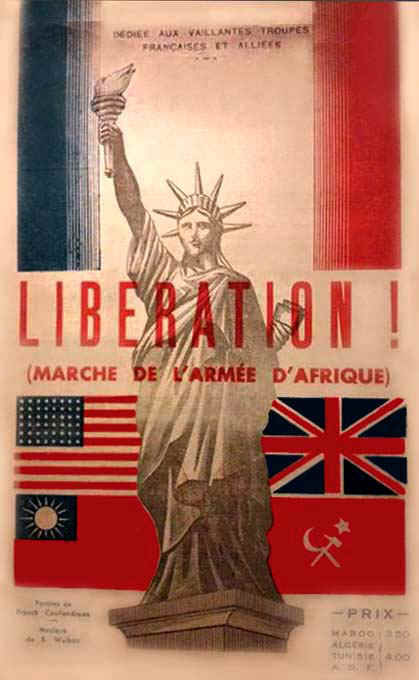 The American YMCA civilians in France were uniformed and they helped both soldiers and civilians. 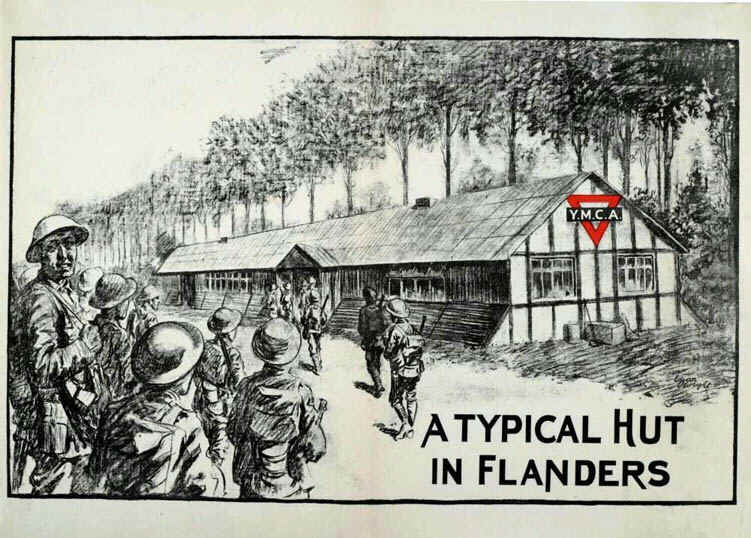 The list of programs and services that the YMCA provided the military during WWI include morale, welfare and recreation activities; rest-and-recreation programs for battle-weary soldiers, sailors and marines, and canteens and overseas exchanges that modernized the exchange concept. The military adopted and routinely offers many of these services for the soldiers today. The American Young Men's Christian Association in its welfare work served between four and five millions of American soldiers and sailors, at home and overseas. As General Pershing has said, it conducted nine-tenths of the welfare work among the American forces in Europe. Moreover, alone among American welfare societies, this organization, first and last, ministered to not less than nineteen millions of the soldiers of the Allied Armies and extended its helpful activities to over five millions of prisoners of war. Its operations were conducted on western, southern, and eastern fronts in Europe; in northern and eastern Africa; in western, southern, and eastern Asia; in North and South America; and in different parts of the island world. It may be questioned whether in all time a human society has ever brought its helpful ministry to such vast numbers of men and over such wide areas, under such varying conditions, and in so short a time. 26,000 paid staff of men and women served with the YMCA. 35,000 volunteers attending to the spiritual and social needs of an armed force of 4.8 million troops. It performed 90 per cent of all welfare work with American Expeditionary Forces in Europe. 286 casualties, including six men and two women working under the YMCA banner killed in action. 319 citations and decorations awarded YMCA staff and volunteers, including the French Legion of Honor, the Order of the British Empire, the Distinguished Service Cross and the Distinguished Service Medal. Operated 26 R&R leave centers in France that accommodated 1,944,300 American officers and men. 4000 "huts" and tents operated for recreation and religious services. The personnel are terribly undermanned and overstrained. Twenty percent of the hut workers are in the hospital on sick leave and others on the verge of collapse from overwork. Men are attempting to do the work of three or four. We must have more men or fail to measure up to what is rightfully expected....The fellow that starts knocking the YMCA when he gets home from the Army better first look around and see if there is a soldier near. It appears the YMCA was a cross between what the American Red Cross, the Salvation Army and the USO were in WWII. Any readers who care to discuss aspects of this article or have information to add are encouraged to write to the author at sgmbert@hotmail.com.